You are driving through a new neighborhood, what is the first thing you notice? You are probably looking at the neighborhood’s homes. The beauty of your house is not the only thing that sets it apart, but in fact, your curb appeal does. Curb appeal can be one of the biggest selling factors for a home. 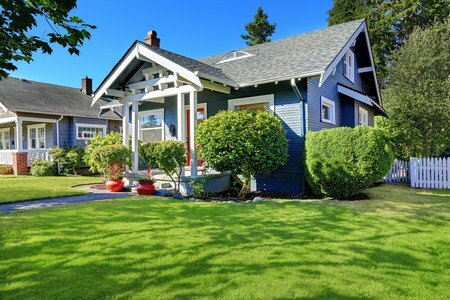 If you are looking to spruce up your home’s exterior on a budget, we have five tips for you! Because, we believe that creating great curb appeal, should not cost a fortune. Your home’s front door says a lot. If you are looking to update it on a budget, you can begin by hanging a door wreath and adding a doormat. These simple decor pieces can help say “welcome home” without breaking the bank. Make sure your mailbox is making a statement by replacing your current one with an updated, modern one. If you are on a tight budget, you can try repainting it and adding new numbers to its exterior. Hung above your front door. Installed next to your garage. The options for displaying your house numbers are endless! Be creative with your house numbers and they will get more attention. Nothing adds beauty like fresh flowers and plants surrounding your home’s exterior. From garden beds to flower boxes, you can instantly upgrade your home with a few added plants. To make sure your plants thrive, be sure to ask your local nursery for plant suggestions. You want to make sure you choose plants that are appropriate for your climate and seasons. The exterior lighting of your home can be an important curb appeal factor. A well-lit home can help guests find your house at night and even deter burglars. Greet your guests with a welcome mat outside of your door. You can pick up an inexpensive doormat at your local store or customize your own with spray paint and stencils. We hope you enjoyed these six types! Check out our other posts at https://proudtobuild.fultonhomes.com. Preparing your home for the real estate market will require an investment. While some homeowners choose to hire a professional home staging company, for many it’s just not in the budget. But do you really have to seek the help of a staging service to achieve optimal results? Don’t fret, getting help from a staging service isn’t the only way to get a Sold sign slapped on your property. Below are some affordable ways you can get professional level staging results without investing thousands of dollars. Something as simple as Welcome Mat at the entryway makes a difference when selling your home. Prospective buyers will usually linger at the front door for a few minutes before they enter the house, so you’ll want to make sure that the entrance of the home is appealing. A quality welcome mat will run you less than $20. To make the entryway even more enticing you can add some hooks to the wall where the coats will go and a fresh plant or two. You’ll want to give your bathroom that fresh and spa like feel. First, you have to remove the toiletries from around the sink, get rid of the tacky shower curtain and novelty bath towels. Easily freshen up your washroom by staging the area with all white towels, bath mats and neutral color shower curtain. Top things off by adding in a fresh flower or a scented candle. It’s easy to neglect things that need to be fixed around the house. Before you know it you’ll have a long list of things that need to be repaired. Don’t invite potential buyers into the house unless you’ve fixed what need to be fixed. Be sure to freshen up the paints on the walls and fix any cracks in the flooring. Even minor things can turn would be buyers away. While removing the personal pictures that you’ve curated over the years sounds a bit harsh, it’s necessary. The purpose of staging a home is so that buyers can envision themselves living in the house. That’s impossible if there are pictures of your family everywhere you turn. Instead, you can purchase inexpensive yet quality pieces of artwork to hang on the walls. How often to you walk past items that are stacked in a corner or piled up on a table? If you are like most people with busy lifestyles it is almost a given. We get so busy with work, school, children and home we start to ignore those messy spots and even program ourselves to walk past and not even notice! I was abnormally brilliant at overlooking, lol! Spring is the perfect time to declutter and purge alongside our often overlooked spring cleaning. Just by decluttering one room per month you will be surprised at how much better you feel and how nice and tidy the house looks! 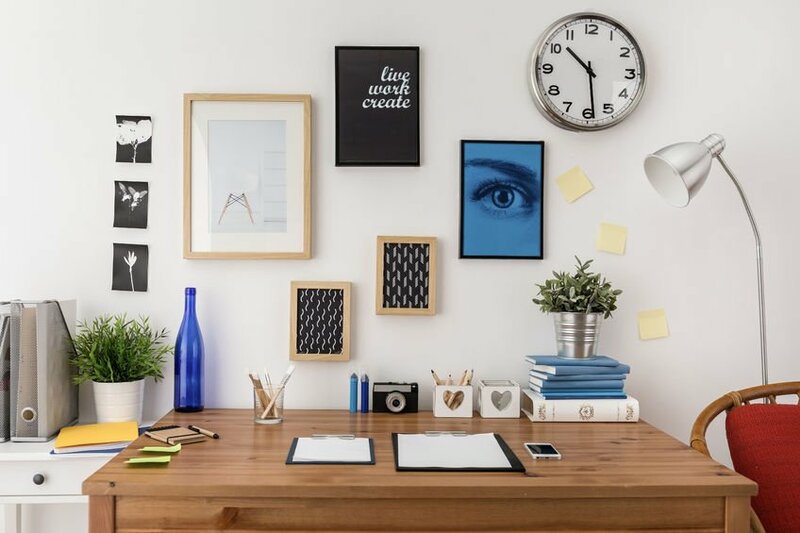 Our easy tips and tricks are listed below for creating a better work/home balancing act just by decluttering! Start in the bathroom using a 40 gallon heavy duty yard bag and begin cleaning underneath the cabinet and medicine chest. Of course, with expired medicines remove or mark out the identifying information. To be eco-friendly, simply drain the remaining contents of plastic bottles and containers, rinse with water and place in your recycle bin. Next head to the kitchen. We know the kitchen will take some extra time especially if you declutter well. Begin in the fridge and check all the bottled and packaged items expiration dates. Next move on to the freezer and do the same thing. Again, use a large yard bag and take the time for the environment and recycle the bottles and plastic containers, etc. Now look elsewhere for unwanted paper around the house like junk mail, advertising flyers, old homework, expired newspapers, etc. Again, place in a large yard bag, but make sure you use a shredder for anything that has personal confidential information. Old broken toys and sports equipment are always a given and should be discarded for safety purposes. Many of these items are large and take up a lot of room. Also, many of these are covered in dirt and other things we don’t want to think about that will most definitely contain bacteria. If there are items that are still in good shape, then donate them, sell at a consignment stores or sell them online. As always, please let us know how your task turned out and please share your thoughts and ideas. Happy Decluttering! Are you looking to add quality without spending quantity? We have seven genius and affordable decor ideas for you to use in your living room this spring. Let’s take a look! 1. The room’s flow/traffic pattern. 3. The focal point of the space. You may be surprised by what a gallon of paint can do for your living room. If your current color scheme is feeling dull, you can freshen it up with a new wall color. You can even repaint some of your furniture to make them feel brand new. While redecorating, you may decide that you want a completely new design. You can redesign your space into something completely new. Leaving the same base of your room will help stay on budget. The base will be items like your furniture, but items like your pillows, curtains, blankets, and decor pieces can be swapped out to match your new design. 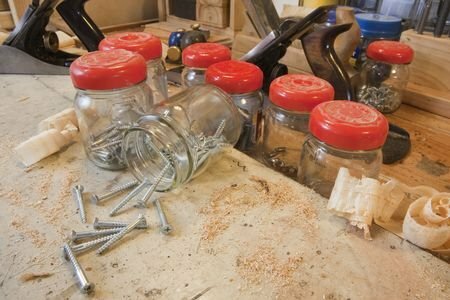 Before you get rid of older items, try and reimagine their use. For example, a stack of old books can be used as a decor piece on a coffee table. The best way to save money in your design is to use things that you already own. You can go through your home and find items that are not being used then incorporate them into your living room’s design. Depending on your space, you may have the opportunity to switch focus to a new point in the room. A different area may be able to become your new “focal point.” For example, if your furniture has always faced the windows, you may want to try something new. Try adjusting your furniture’s focus to point in a new direction. Maybe you have a gorgeous fireplace that you want to show. Now is your time to redirect the focus to that specific area. Antique and thrift shops are the perfect places to find old, well-kept furniture for an affordable price. While shopping, you want to get creative and try to see items with all of their possibilities. An old dresser may look unappealing now, but with a fresh coat of paint and some new hardware; it could look brand new! If you are on a tight budget, buying all new furniture may not be realistic. Instead, you will want to try to repurpose some items that you currently own. You may be pleasantly surprised by what you can accomplish with your own items. We would love to hear your decorating ideas! Leave your thoughts in the comments below! Tired of those pesky invaders marring your garden? Yes, when your garden springs to life during the spring and summer season so do the weeds. Managing the weeds that pop up in your garden can be super challenging. It often results in an all-out war. The key to effectively managing weeds in your garden is understanding their role in the ecosystem. It may seem like spring is still far off, but now is the time to start planning. What exactly are weeds? Weeds are unwanted plants that grow in a garden. They don’t take on one specific look. In fact, they can belong to a branch of any plant family including; grass, tree perennials or even an annual. A weed can be a native species plant or a plant that has already been introduced to the garden but grew out of hand. Weeds can change based on their geographic location. They even spread by roots, seeds, and runners. While these unsightly plants are often undesirable they can offer many benefits. Some weeds are edible while others serve as a food source for pollinators. Weed grows in compacted soil and rich soil will greatly reduce weeds. If you have a vegetable garden you should form your soil beds at least twelve inches high and fill it with high-quality soil. Line the bottom of the soil bed with cardboard which will smother intrepid weeds. The smaller the weeds are the easier they are to remove. Therefore, you’ll need to perform regular maintenance to remove them while they are small before they have time to go into seed mode and spread further. Weeds on raised beds can simply be plucked away with your fingers. 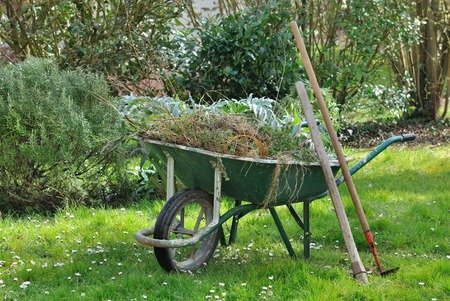 When removing weeds, you’ll need to pull them out by the root or the whole plant. Weeds with fibrous roots you will have to dig around the entire plant. If you have a big weed problem, you can try smothering or solarizing them which will starve the soil of oxygen over a few weeks. While this is a drastic measure it will definitely be effective at staving off weeds. Have you looked out your window only to realize that the surface was marred with streaks and smears? Or maybe, there is dusting gathering at the bottom of the window sill? Dirty windows can take away from the overall aesthetic of your home. It can be a challenge to get your windows clean and clear. We’re going to show you a few tricks to get your window looking spiffy. 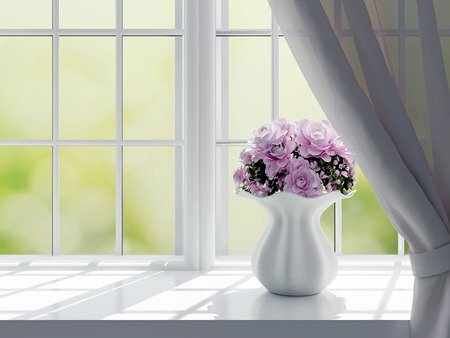 Before you begin cleaning the window it’s time to tackle the window sill. Yes, pull out the vacuum. Use the detachable upholstery tool to vacuum the sill and remove dust, spider webs, and grime. If you have window treatments like blinds and shades you should clean the dust off them as well with the vacuum. Drapes and curtains need some attention too. If you have large windows, then you’ll want to thoroughly clean them with a squeegee. You’ll need to tackle this job with a bucket of hot water and just a few drops of dish soap. The dish soap breaks the dirt down and makes it easy to wipe off with the squeegee. Cleaning windows with panes can literally be a pain to clean. You can use an eyeglass cloth that is used to clean lenses to attack the window. You can find an eyeglass cloth at almost any store with a pharmacy. Spray a bit of water on the cloth and wipe away the smudges and dirty spots to achieve that crystal clear look. Sky high windows are a beauty but cleaning them can be extremely frustrating. When cleaning windows that are out of your reach you’ll need a telescoping microfiber dust. You can spritz water onto the duster portion of the tool and proceed to wipe away any foggy buildup. To avoid streaks on the window, clean and dry the inside portion in a horizontal motion and the exterior vertically. This will help you to find the streaks more easily. Window screens attract dust and dirt. Avoid washing them. Instead, wipe them clean with a dry microfiber cloth which works to pull off the contaminants from the screen. 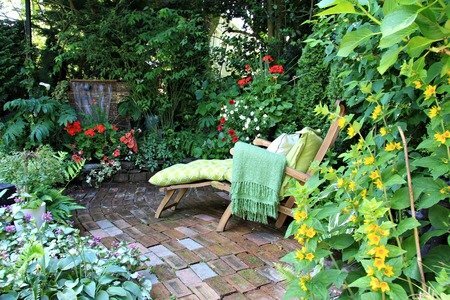 Creating a garden can be one of the most relaxing and enjoyable tasks you do. Everyone has their own idea of what makes theirs perfect but what makes it fun is customizing the space so it brings a smile to your face and gives you a sense of accomplishment. It also needs to have a unique look that lets your personality shine through and adds visual interest to your home’s exterior. Here are a few unique ideas for your garden area. To start, try shaping your garden area in a unique way to catch the eye. Using a shaping tool, carve out areas of grass to create a geometric landscape that immediately lets all who enter know that they are in for a visual treat. Whether the design is soft or shaper looking, it’s all about creating your personal vision. No matter what style you choose, be sure your distinct lines direct the eye towards your garden’s focal point. For entering the garden, try a mosaic walkway with bright colors that complement the garden’s features. Light the way with uniquely shaped solar lights and assorted garden art. Hanging wind chimes, painted rocks and decor influenced by outdoor wildlife (birds, rabbits & squirrels for example) will add whimsy and a natural touch. Plant unique flowers that will survive in your geographical area but are not as commonly seen in your neighborhood. Showcase flowers and herbs in a unique way through spilled pots and hanging baskets. Use brightly painted wooden stakes to mark cooking herbs for easy gathering. Break up all the leafy areas with a rock-filled spot equipped with comfortable outdoor seating and a calming water feature-be it a small waterfall or fountain. Having a place to sit and enjoy your garden is very important, so go with seating that will make you want to linger and take in the sights. For a little extra fun, add a fairy door and tiny home exterior to a nearby tree to create a little fantasy area that children will love. Consider a uniquely shaped birdfeeder as well so you can let nature come to you while you enjoy your outdoor getaway. Start brainstorming today. This is your vision, so there’s no wrong way to do it! Let your idea of an outdoor escape become reality. 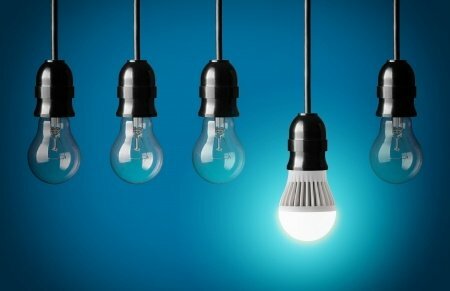 As your incandescent bulbs burn out, it’s a good time to consider switching to LED bulbs. You have always counted on incandescent bulbs to provide a warm yellowish hue for the home. LED bulbs come in a wide range of colors, last for years and are cooler to operate. We have put together a few tips to help you determine how to choose the right color LED bulb and more. LED bulbs can display a wide color range from red to purple, whites and yellows. For the home, generally, we are still looking for the warm yellow that incandescent bulbs produce. The most popular colors for LED bulbs are “warm” white or “soft white and “bright” white. “Warm” white and “soft” white produce a yellow hue like incandescent bulbs. “Bright” white bulbs produce a white blue light like daylight and retail store lighting. Light color or color temperature is measured in kelvins. The lower the number, the warmer more yellow the light. Typical incandescent bulbs are between 2,700K and3,500K. To ensure you are purchasing a warm yellow bulb look for this range when shopping for LED bulbs. LED bulbs are more expensive than the old incandescent bulbs, but are cheaper to operate. LED bulbs will pay off in the long run, they produce less heat, last much longer and can be operated by smart phone technology. As more competition is entering the market, we are already seeing the price of LED bulbs falling and becoming competitive in the market place. Be aware that unless you are replacing many incandescent bulbs in your house, you will not see significant savings in your power bill. Please note that due to their circuitry, LED bulbs are not always compatible with traditional dimming switches. You may need to replace with a LED compatible dimmer switch, or pay slightly more for a compatible LED bulb. If you experience a LED bulb humming, buzzing, or flickering you need to replace with a compatible dimmer or replace with a compatible bulb. Not all light fixtures or lamps can be used with LED bulbs. If your LED bulb last less than a year, it is probably due to an old fixture or lamp. As always, we love to hear from you. Please let us know your thoughts and ideas per this helpful topic! MetalChain Organizer: Attach a hook to your garage wall then hang one end of a metal chain on it. Tightly wrap up your garden hose and secure it onto the metal chain. Attach the other side of the metal chain to your hook and voila, no more tangled garden hoses. It is just that easy. Old Lockers Transformed: Lockers are not just meant for books and backpacks, but they are perfect for storing all garage-worthy items. Touch them up with a nice coat of spray paint and they will look brand new.